Berkeley, CA — Taekwondo athletes from around the world will converge on the UC-Berkeley campus for three days of competition in May. The 1st Pan-Am University Taekwondo Championship will take place May 28-29 and the 40th UC Open Taekwondo Championship will be held May 30. 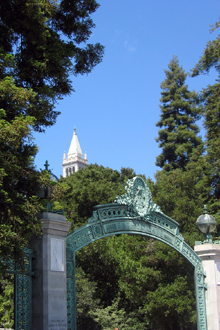 Both events will take place in Haas Pavilion on the UC-Berkeley campus. For the Pan-Am tournament, doors open at 5:00 PM on the 28th and 9:00 AM on the 29th. For UC Open, doors open at 6:30 AM and the opening ceremony begins at 8:30 AM. Taekwondo, "the way of the foot and fist," is a full-contact martial art based on ancient Korean self-defense techniques. Taekwondo athletes are noted for their powerful kicks and agile footwork. In both tournaments, athletes will compete in forms (poomse) and Olympic style free sparring (gyoroogi). The UC Martial Arts Program is an organization devoted to bringing exceptional martial arts instruction to UC-Berkeley and the local community. Founded in 1969, it is a pioneer in martial arts instruction, hosting multiple tournaments each year and sending its taekwondo competition team to victory in nearly thirty National Collegiate Championships. Since the first tournament forty years ago, the UC Open has grown into one of the largest and most popular taekwondo tournaments on the West Coast. This year UCMAP expects around 700 competitors from around the world to participate. Federation (FISU). Competitors from more than forty countries have been invited to participate in the Pan-Am tournament.